Starter Solenoid Aftermarket - Quality aftermarket replacement starter solenoid. Replaces original exactly. 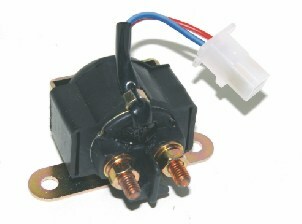 If you would prefer a Suzuki OEM solenoid, please click here. Price does not include shipping. 50 state shipping for this item will be $3.25. When ordered with other products, the shipping cost will be calculated based on the weight of the total order.